Happy St. Pats! I am a lip crayon FANATIC, to put it lightly. I've tested every brand ever released. I have 3 Muji drawers full of them. They're in all my bags because they are so easy to apply. And they've started coming in different finishes--more on that in a moment. So when I spotted some from Hard Candy at Wal-Mart recently, I had to pick up a couple to see how they are--the packaging and finishes reminded me of ones from Revlon. I had to compare them and am sharing my results with you. I call this weekly series, This or That. I couldn't find a picture of the current packaging (please forgive me as this post was written in preparation to take care of my Dad, so I was unable to take pics), but it looks exactly like Revlon. The clear cap is gone. The glittery finish has the shiny packaging and the original formula has packaging as pictured above. The Laquer Balm does have a fine glitter, depending on the shade, but nowhere near the volume of the HC one. I like these better than HC but prefer the original or matte formulas. The original formula has a nice stain to it that lasts. It has a mint scent. Revlon, for both formulas, hands down. While the packaging was the same, these differ in quality. If you are looking for something unscented and moisturizing, go for the Hard Candy one. But, if you want staying power, Revlon will be your best bet. Today the youngest one I nanny for turns 1! Lots of luck and love for her! I am glad you hear that Charlie is doing well. Poor baby! You have been through so much at once, when it rains it pours. Hopefully the luck of the Irish will turn it around! You got me hooked on Revlon lip crayons last year. I don't even want to try any other brand. They really have amazing colors and their staying power is amazing! I am sorry to hear about Charlie, but I am glad he is back to normal! 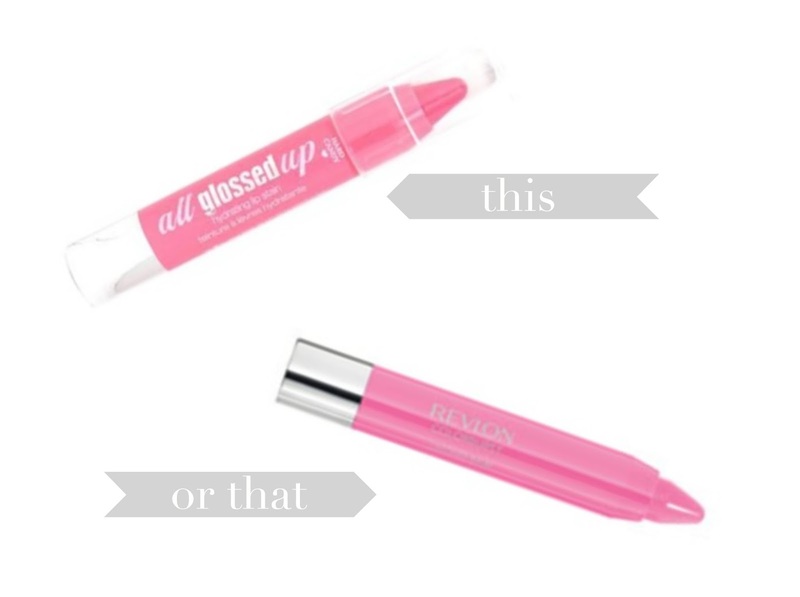 I have a serious obsession with lip products, and both of these look like winners to me. I am so sorry to hear about Charlie. Is he going to be able to eat regular food despite his missing teeth, or is he going to be on special food now? I love the Revlon Just Bitten stains! They last so long for me! I've never tried the Hard Candy but sounds like I'm not missing out on anything! Glad Charlie is feeling better! I need to try those Revlon ones. I've been stuck on the Clinique chubby sticks and love 'em, but wouldn't mind the cheaper price version. So happy to hear Charlie is okay. You're due for some happier times any day now. I never heard of Hard Candy before, probably because I don't have it available in the places I shift living. But when I read Glitter I feel happy - though you said it messes all up, with glitter everywhere... that's bad! I think I would go with the Revlon one, since it's your favorite and it has a matte finish among the offers. I don't like the ones that are creamy or glossy, because they tend to fade quickly, so I apply lipstick first and then a light layer of gloss! But depending on the brand it fades anyway :) I will try the Revlon ones! Huge fan of lip crayons. I've only used the clinique brands, but I'll give Revlon a try. Thanks, lady! I want to try the Revlon! I've been using a Neutrogena Lip Crayon like crazy that I'm absolutely obsessed with! I feel like Hard Candy makeup is so hit or miss, so I'm glad I didn't waste money on these lip crayons. I'm a huge fan, too, and Revlon is the best - even more so than the higher-end brands in my opinion! OK, next time I am near a Wal Mart I am getting these glosses from Revlon. I purchased one ages ago but never used it. Your St. Patrick's comment today made me laugh. My luck for the day and for this week is for Vivian to get to her normal, happy, non-sick self, for her to regain her strength, appetite and happiness. Happy Birthday to the little one you care for! So glad to hear Charlie is doing better. I'm sending so much luck your way it's not even funny. Keep your head up girl! I've tried the Revlon lip crayons and for the most part I liked them, but they were a bit drying at times. Have you tried the Rimmel ones? I had one in had last time I was at the store but put it down because I couldn't stop second guessing myself. I need to try more of those Revlon lip crayons! They really are fab. Happy birthday to the little one! My daughter will be turning one soon as well! Ahh how time flies! This review is so helpful. I've been using Revlon but didn't know if Hard Candy compared! Thank you for this! I love the Revlon ones! I have a few colors and wear them all the time. I'm glad to hear the Revlon is the winner since I don't live near a Walmart store. Glad to hear Charlie is back to normal. Sounds like Revlon wins hands down! Esecially for it only costing a tiny bit more! You are right - you don't need any more bad for the year! I love that lip things are affordable. I've never tried the hard candy ones. I have a few of the revlon ones but my color choices didn't work well so I need to try more of them! Anyways, I do not have any of these but now I want to try them! I haven't tried one Hard Candy product but I love the revlon crayons. That is so sad about charlie being bitten and having his teeth removed :( I'm glad hes feeling better! I have tried the Revlon ones but my lips are so pigmented it is hard to find a shade I like. I do like how they wear though. I didn't realize Charlie had to have so many teeth pulled, poor baby!! Sigh, Hard Candy. This reminds me- they're totally bringing back the old polishes in April! I might need to pick those puppies up! I've never tried one of these, but the Revlon crayons sound great. I'm so sorry to hear about Charlie's attack. I am glad he's OK! I'm glad to hear that the revlon is better--I just picked one up in the Matte finish, but I can't remember the color name. It's a bright coral/pink. I like it but it is a little drying (but I'm guessing that's typical for a matte finish). Glad Charlie is okay! I'm going to have to try the Revlon ones! I have a few from Avon and love how easy they are to use! Poor Charlie! So glad he's on the mend!! Love the Revlon lip butters and so glad to hear Charlie is doing better. I have always wondered if I should try lip crayons. Thanks for this review, I think I will give one a try. I haven't tried these, but Revlon sounds good since I'm all about staying power. Glad Charlie is back to normal! Glad to see your review--I was wondering if the HC crayons were any good! I agree 100% Revlon hands down takes the cake, although I haven't even tried the HC ones for myself, I trust you opinion, and honestly what is better than the Revlon ones?! oh, I'd love to try one of these! Thanks for the heads up! I will pass on these!! I usually go for natural lip colors, so no glitter. The last lip crayon I bought was from Clinque. I love it. I love those Revlon lip stains! They're my favorite! I've got to try the lip crayons. They look like they would be easier to apply. I think I've got a Clinque somewhere! Poor Charlie...did he lose his teeth in the attack? So glad he's back to normal! Revlon is pretty hard to beat! I haven't tried either but per your recommendation I think i'd try the Revlon since I did have lip crayons on my list of things to try soon. Im glad Charlie is ok! Wishing you nothing but positive things for the rest of the year girl! It seems like every brand has come out with a lip crayon. I haven't picked up a Hard Candy item in AGES lol so it was a bit of a throwback when I saw your post. I've tried the gloss and matte version of the Revlon and I much prefer the matte myself. I feel like the color pops more. You are the reason I own three Revlon lip crayons. I love them!